Remember Masdar, the car-free neighbourhood in Abu Dhabi that was going to show the power of "personal rapid transit" (PRT)? Let me introduce myself. I am a transport planner and I am partner of a consultancy Company named MLab (mobilitythinklab.com), based in an obscure corner of Italy. Nothing to brag about except that I have had the chance to participate in two very interesting experiments that concerned automated, driverless vehicles: the Masdar City "Personal Rapid Transit" “automated taxi” transit system and the CityMobil2 experiment with automated minibuses in a mixed setting. In 2006, I proposed to London’s architects and planners Foster & Partners to choose PRT as a sustainable, non-polluting transport system in their bid for Masdar City’s masterplan (which they won). To make a long story short (my involvement in Masdar City lasted 3 years) we soon realized that the dream of using “automated taxis” as a mass transport system often resulted in… queues of taxis at pick up points! We then tried a “group rapid transit” strategy, as opposed to “personal rapid transit”: timing the podcars to travel at fixed intervals and on fixed routes at peak, so that they could fill up on most requested routes. This strategy did work, although the capacity almost tripled, it was not that of true mass transit (but in densely built Masdar City there was no room for big mass transit) but then the economic crisis arrived, the plan was dramatically downsized etc. etc. Bottom line: When "personal rapid transit" succeeds, it succeeds by turning into a conventional fixed route transit system. The fantasy of "personal" transit is that a vehicle will be there just for our party and take us directly to our destination, but in constrained infrastructure this only works if demand is low. But PRT was meant to the the primary transport system in a car-free city, so demand would be high. It was never going to work. Luca takes on driverless taxis in part 2 of his letter, coming in the next post. Albert Einstein’s famous quote: “Insanity is doing the same thing over and over and expecting different results.” The personal rapid transit vehicle pictured above looks and behaves exactly like the typical car, so why do these mlab planners expect it to behave any differently? They must be insane. 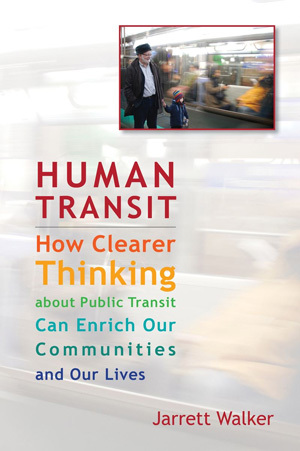 PRT is indeed stuck in a dilemma: if it’s successful, it can’t provide the capacity for truly “personal” transit, and if demand is low enough that it actually works as “personal” transit, then you’re spending a huge amount on the guideways and vehicles with too little ridership to cover that cost. Either way, PRT is not the answer. I’m curious to hear about how the experiment with driverless taxis went. At least those don’t require hugely expensive separate infrastructure. The concern raised about traditional PRT in this article is that it creates bottlenecks at termini. That’s not “behaving as a typical car,” it’s a key difference from typical cars which can be accessed anywhere. Anonymouse adds the second concern about traditional PRT – that it requires building a whole new right-of-way making it astonishingly expensive and limited. I think Google and autonomous vehicle advocates will argue that their robot cars will solve both of these problems and be a lot safer than the personal car – and if they’re right we will hear a lot less about PRT other than for the localized group rapid transit people-mover as described. (That, of course, would lead to a whole different series of unanticipated side-effects). I suspect there will still be PRT “true believers” taking issue with this finding, never mind it is based on empirical experience. In our review of the proposed Masdar City PRT system we found many layout design flaws that prevented it from functioning optimally. Circuitous routing caused many trips to be inordinately long and often resulted in returning empty vehicles sharing the same link as departing occupied vehicles. We do not believe the Masdar system would have functioned optimally had it been built out as planned. This was a planning/design flaw, not a PRT flaw. However, we have been modeling a system with high demand and have found that, with a little ridesharing, PRT can have high capacity in an urban environment. The results of our study were presented at Podcar City 8 by Professor Ingmar Andreasson. Here is the link: http://www.podcarcity.org/arlanda see Andreasson under Documents. You may also visit http://www.prtconsulting.com for more information. @rob: so basically prt combines the bad points of driving and transit- the low capacity of automobiles and the fixed routes of transit. What were they thinking? I can understand the appeal of “individual transit” to the average person, but the planners on this masdar project could have easily pointed out the flaws. They had the chance to make this a model city, but now they have to make do with a low capacity system that does the same thing a high capacity bus does. I guess if I was planning a city from scratch that had no cars or roads already, and I had an endless budget, I might consider building a ubiquitous and automated PRT/GRT system and devoting streets to people, bikes and the occasional delivery truck. Then you’d get the promised benefits – safety, efficiency and more livable streets. Cost would be high, because the public would have to fund both rights of way and vehicles, while car-owners now shoulder the majority of driving costs, but if its designed in from the start that might be the better alternative. But replicating the entire auto system once it’s built would be a fantastic and wasteful endeavor. The system can’t replace the car until it’s fully ubiquitous; the added rights of way need to tower over streets; the costs are on top of what we already spend on driving; and we would still have cars and trucks dominating the streets we live on. The one place PRT was considered seriously in the Puget Sound area where I live was at the Sea Tac Airport. There the entire impetus was to allow hotel and rental car customers to get directly to their destination without having to stop at competitor hotels or rental agencies. These companies already pay for group mass transit circulator vans at their own expense – so eliminating the need to stop at competitor businesses seemed to be the sole motivation for what would have been upwards of a half $billion public expense. I think this is not the only case where transportation logic had little to do with the project’s consideration. A PRT system was launched in Amritsar, India in 2011. It would have been an 8 kilometer (4.8 mile) system that connected heritage and religious sites. The vendor claimed it would carry 100,000 passengers a day in 200 pods. It would have been the world’s largest PRT system. Over time the disadvantages became apparent and the project languished. Meanwhile the state has moved forward with a BRT system. After more than 50 years of promotion, modeling, and testing, PRT has not proven its feasibility in heavy duty service in any city in the world. Sort of like what I say about BRT, it can be a slippery slope to rail. It’s sad that there is so much aversion to a bit of healthy walking and it’s sad that waiting with our thoughts is so anxious for many as well. Yet we wait for the now driverless free communal electric pods all the time when we navigate tall buildings. I guess we have adapted to elevators. This is a great demonstration of why self-driving cars are not the panacea that their proponents imagine them to be. I appreciate very much that Peter Muller chose to comment my letter. We received Peter’s review at an eary stage of the Masdar City PRT project, and we found his advice very valuable to improve the system. Indeed, many routes were extremely tortuous, but one must consider that we were facing several constraints: for example we could not modify the layout of the streets but only decide in which direction vehicles could travel. But on the other hand, we could advise the urban planners on where to put the buildings so we aligned the major generators/attractors along the most direct lines, leaving the tortuous ones to serve the small numbers on the O/D matrix. It makes little sense in fact to design a transport network assuming that all O/D couples are identically important. The PRT system of Masdar City did work, and it did deliver the required performance according to our simulations. But at peak hours, it did so only by applying a rideshare strategy to fill up the vehicles and therefore transforming itself in public transport. The congestion did not appear along the lines but at stations. Masdar City is very compact and space constraints prevented building stations with more than 8-10 boarding berths. By assuming that each 6-seat vehicle would carry 1.2-1.5 passengers, capacity was obviously reduced dramatically and at major stations the result was a queue of vehicles like the queues of taxis that you can see at major airports or train stations. I’m a little confused. I thought one of the selling points of PRT was that vehicles would in fact queue up, and wait for passengers at system access points. How is this now a flaw? In Mr. Guala’s letter above, his explanation for non-optimal PRT operation included the phrase “we could not modify the layout of the streets,” and I think this will also be a problem faced by self-driving vehicles, which must travel along established street routes and contend with street traffic, much of which will be human-controlled and so, more potentially chaotic. People who want to take advantage of the existing roadway infrastructure must also put up with its disadvantages, one of those being that modifying or extending it is much more expensive than doing the same for an elevated PRT guideway. The “rubber hits the road,” as they say, when you want to build out or provide alternative or detour routes within an existing system. Conventional, earth-bound roadway construction is prohibitively expensive to allow much of that. But new elevated guideway can be installed to serve new territory, or to provide detour routes around stretches that are undergoing maintenance and repair, much more quickly and inexpensively than traditional roadway. Because the PRT guideway is separate from the roadway infrastructure, the PRT system operators would have much greater control over its layout than they would over the layout of the streets. It seems to me that PRT can work, but perhaps can only work, if system access points (stations) are as ubiquitous as advertised (about 1/2 mile in any direction along the guideway); I do not get the sense that Masdar City access points were as numerous, and perhaps Mr. Guala can enlighten us on this point. Information about system capacity and congestion at access points, or via an app, might help passengers to route themselves to points of entry and points of exit that are least congested among those nearest to their intended points A and B. One of the virtues of PRT is the dispersion of demand, and the choice afforded passengers to modify their trips slightly to (greatly?) reduce net personal inconvenience. Finally, the desirability of shifting between personal service and GRT has been known for decades. That is exactly how the Morgantown PRT handles peak congestion challenges at the University of West Virginia. There, we would certainly expect such an approach to be necessary and effective, as the number of stations is small (5, vs. the 10 or 15 expected in an “optimal” PRT arrangement) and the population to be served is large and often concentrated at only a few locations. Still, as Mr. Guala observed about Masdar City, the adaptation works, allowing even a non-optimally designed PRT system to serve passengers successfully. PRT pencils out when you get headway down to the level automation allows. Current PRT is still experimental with 2 second headways, or only 1800 vehicles per hour. Lower that to 1/2 second and you have the capacity of a six lane street on two little tracks. I’m not a PRT “true believer,” but I remind people that even Sprague’s trolley car looked primitive when it rolled out for the first time in 1887. With its sparking motor, many experts surely thought the cable-drawn streetcar would dominate transit for another 20 years, rather than be swept away in a decade. In my study of connecting Waikiki to Ala Moana Center, I found that a modified GRT strategy was necessary to keep fleet sizes in reason. Nonstop service was provided at peak times, but only by boarding the particular vehicle bound for that particular destination. This is still a huge advantage over conventional transit which maintains huge fleets of idle vehicles during non-peak times. ^ Only ineffective transit. All cities have demand for transit going everywhere, not just downtown (obviously). But if you create a radial, centralized transit network it will *seem* like all demand is for downtown, only at peak times. When is this PRT fantasy going to die. Let’s again laud the Heathrow 3 station over budget delayed PRT and W. Virginia’s Nixon 1970’s five year to build 5 station fun ride. After 50 years that’s it, not even Disneyland. in response to J. A. Merrit’s post: Masdar City is a very compact development, with narrow and tortuous streets to keep the hot desert winds out and allow for “differential cooling”. This layout was not negotiable, and it was not an optimal layout for running high capacity transit, because of space restrictions, but also accomodating small high frequency vehicles such as PRT was problematic. For instance, elevated guideways were proposed at first (you can see them in the earliest renderings of Masdar City) but then the decision was taken to sink the PRT routes below the pedestrian level. Because of the diffculty of digging in the muddy terrain where Masdar City is built, the whole ground level of the city was lifted and built on a concrete slab. Inspiration came from the town of Louvain La Neuve in Belgium. The number of stations of the PRT system of Masdar City was high, even too high in my opinion. There was a station every 150m of walking distance, and 80% of the population lived or worked within 75m of one or more stations. This was good for some reasons (for example, very short walking distance to the nearest station, important where temperatures may rise to above 120F) but bad for other factors, for example, there was very little space to align many boarding berths, or allow vehicles to queue before they blocked a junction, or another station. As for the GRT strategy, I never claimed to have invented it, rather, we applied to this system what we knew was a well known method to increase the carrying capacity. The PRT was chosen also having in mind the economical, social and urban conditions existing in Abu Dhabi at the time: the strong value of privacy, the absence of any public transpor whatsoever, the peculiar social mix. The project was started in 2006, before the crisis struck the Western World. Oil price reached 140 USD per barrel in 2008 and money seemed to flow endlessly. Building a city of 100’000 over a concrete slab and serving it with a newtork of automated taxis was challenging, but did not seem at all impossible. All this was to change abruptly only a few years later.